Hilliard, Ohio -- When it comes to identifying the source of the extraordinary volunteering spirit at Stone Oak, it almost sounds like a blame game. Time and again, residents credit former Lead Concierge Kathy Prosser for inspiring them to get involved. Prosser, meanwhile, insists the residents drive the efforts. They do agree on one thing: It’s made them extremely proud of their community. Prosser joined Stone Oak in October 2015, before the community even opened. One of her first actions was to survey the residents and gauge their interest in volunteering, and to learn what types of activities and programs they’d be interested in. The Caring Hearts, as they called themselves, did just that with the Capital Area Humane Society. Volunteers organized a communitywide newspaper drive. Newspaper is used to line the animal cages. When Prosser’s own double garage was bursting with 440 pounds worth of newspapers, the volunteers bussed over the bundles and surprised the shelter with their contribution. Then they were given a backstage tour of the facility. 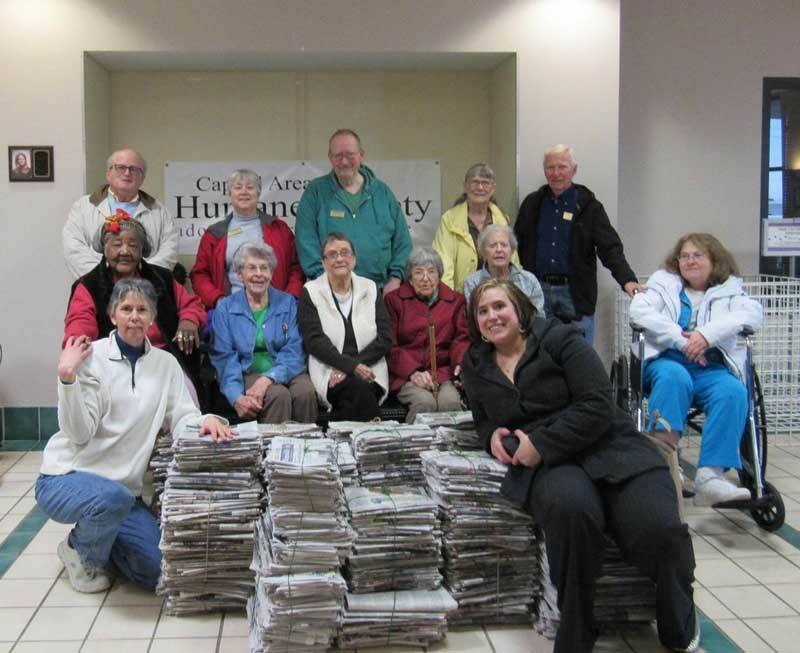 The Caring Hearts, with Kathy Prosser at front left, proudly display some of their newspapers, donated to the Capital Area Humane Society. Kathie said that while there was already a spirit of caring at Stone Oak, Prosser brought focus to their efforts. Last year, the Caring Hearts donated 281 pounds of food to the Military Veterans Resource Center and hosted 16 vets and their families for dinner. Money went to the Arthritis Foundation and the Alzheimer’s Association through a “Rock-a-thon.” They also made 50 snack packs for the Ronald McDonald House. And then there’s the Charlie Brown-looking “giving tree.” For the last two holiday seasons, residents have knitted or donated so many hats and scarves to hang on the tree and donate to homeless charities that they feared it would topple over. 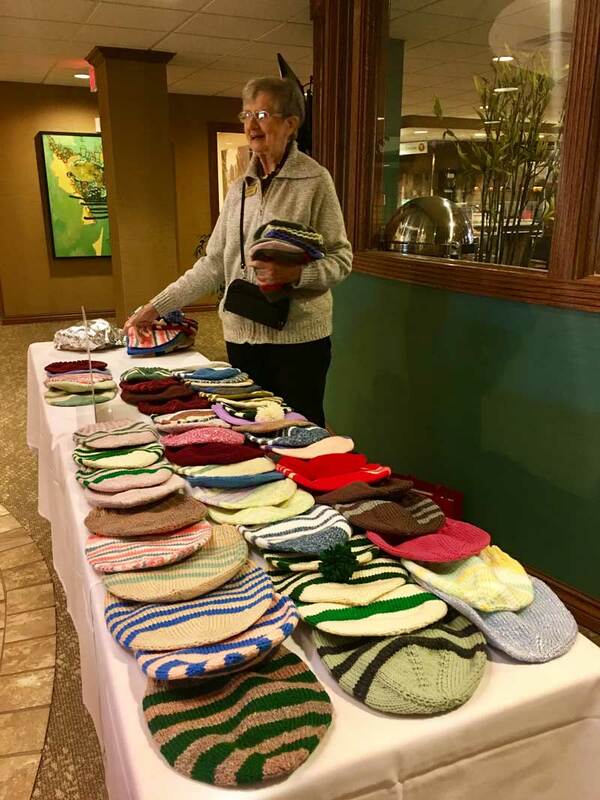 Theres, another Resident of Stone Oak, said that in her first year of knitting club, she aimed to make 15 hats for the tree. This year, she knitted 100. Theres is now selling the hats and donating all the proceeds. The last 50 that she sold helped to finance a new roof of a Florida school, after it was damaged by hurricanes last year. Kathy Prosser was recently promoted to Field Training Manager at Resort Lifestyle Communities, bringing her compassion and leadership into the training of other employees. She will be missed by the Stone Oak residents who are proud and happy for her career advancement.